Easter circa 1977 consisted of a new floral print dress, a cute hat, and lots of candy. I have vague recollections of frozen fish sticks on Fridays and at least one failed attempts to give up candy for Lent, and the rice bowls collection boxes we brought home, constructed, but never filled. Super holy, huh! Mom and Dad were not exactly church folk, a real shame, as they missed some glorious opportunities to experience real joy. While our Easter celebrations get lost in menus, egg hunts, and new floral dresses, our Triduum celebration belongs all to Jesus. Holy Thursday, Good Friday, and even Holy Saturday, we surrender those days to the traditions of our Catholic faith. The activities of these days have evolved over the years, especially as our children age, but the heart and intent remain focused on growing in holiness and hope. Holy Thursday kicks off the Triduum fun with the evening Mass. My daughter loves Mass at night, with the darkened stained glass windows portraying the darkness of the days we are about to experience. Twice, our family has been invited to participate in the “Washing of the Feet” ceremony. Sitting before the peering eyes of the parishioners can be horrifying and humbling, but when you realize what you are being asked to reenact, the horror dissipates, replaced by honor and awe. Our parish also participates that night in a beautiful tradition of visiting seven churches (no one seems to know why we visit seven). At one time that was easy, living next to a rural city with several churches. Over the years, as the Church crisis continues, there are fewer and fewer to visit. We can still achieve the seven visits in two hours, but it feels as if the day when we will be lucky to get in 4 or 5 is around the corner. I guess that will be my prayer intention this year as we adore Jesus in the Eucharist, from church to beautiful church. Good Friday, we fast. True confession time. In my early re-version days, I would sleep in the afternoon, tired from the fast, looking to find an easy way to pass the time. It was not until I read Scripture that I realized the significance of the slumber: “Could you not stay awake one hour?” Now, I head to my parish for three hours of prayer and solitude…well, until the teens arrive to practice the live Passion Play. In the evening, my family returns to our parish for Good Friday services. 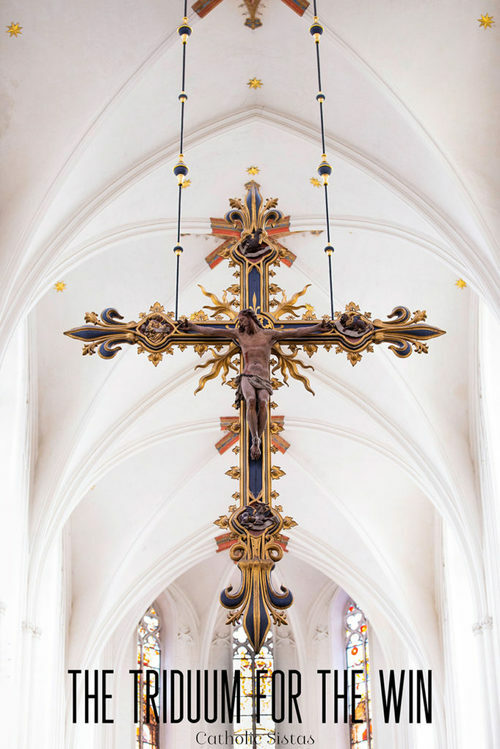 In the past few years, our pastor blessed us with the opportunity to venerate a relic of the “True Cross”—affixed to the large wooden cross presented at the altar during the services. The relic’s authenticity was said to be proven by a miracle of a deaf person hearing once again. For years, my family has each watched, hopeful and curiously, as my daughter, Faith, who is deaf, approached and kissed the relic. Inevitably, one of us would lean in and whisper into her ear to see if Faith had received miraculous healing. This year our pastor and his glorious relic have moved on. Our faith is strong enough, however, to realize if God willed her to hear, with or without the glass-encased sliver of wood, she would. Holy Saturday is a bit more challenging to keep since it is the awkward day of waiting. The tomb is empty, but we are not yet ready to celebrate it. We have preparations to make for the following day’s meal and company but we want to remain mindful of all we have seen and heard in the last two days. Was that how the women felt preparing for the Sabbath after Jesus’ crucifixion? They had so many details for the day to attend to, yet each was mourning, probably exhausted from the previous day’s events and emotions. They worked, waiting until they could visit Jesus in the tomb, surrounded by an odd silence and uncertainty. Before we burst forth with Alleluias and the Gloria, the Triduum holds treasures of its own. We cannot fully appreciate Easter without the garden, His Passion, the Cross, and even the waiting.